Founded in 1962, Fort Worth Country Day (FWCD) is an independent, coeducational, nondenominational college-preparatory school located on approximately 100 acres in southwest Fort Worth. Named one of the “Most Livable Communities,” Fort Worth is the nation’s 16th largest city. A major center for industry, technology and transportation, Fort Worth is home to many corporations, including American Airlines, Bell Helicopter, Lockheed Martin, Pier I Imports and RadioShack. Fort Worth boasts several world-renowned museums and a thriving performing arts scene. Fort Worth Country Day is accredited by the Independent Schools Association of the Southwest, (ISAS). ISAS, a member of the International Council Advancing Independent School Accreditation (ICAISA), has voluntarily submitted to a rigorous and impartial review of its accreditation program and demonstrated its adherence to the Council’s Criteria for Effective Independent School Accreditation Practices. ISAS is commended by ICAISA for the quality of the Association’s accreditation program for its Member Schools. Current enrollment totals 1,063 students. 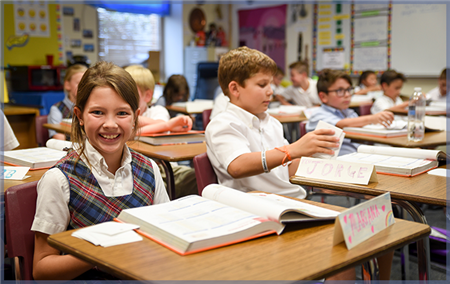 8:05 a.m. - 3:45 p.m.
Fort Worth Country Day cultivates the joy of learning in a safe and structured environment that ignites the power of imagination and creates a foundation for the love of learning. For Junior Kindergarten and Lower School, the activity fee covers all books, school trips, the yearbook and supplies. The activity fee for Middle School includes all of the class trips that are unique to the Middle School program as well as the yearbook. The activity fee in Middle School will not eliminate bills for certain elective items and it does not include the cost of books and supplies. Currently, there is no activity fee in the Upper School. Additional optional charges depend on the degree to which the student is involved in sports, arts and academic activities offered at FWCD. Some examples: athletic teams in grades 7-12 require the purchase of appropriate sports equipment and shoes; ballet students purchase annual recital costumes; musical instruments can be rented through FWCD for $250 per year. Seniors have additional charges for SAT and Advanced Placement tests, as well as for graduation. Need-based financial aid enhances the student body of Fort Worth Country Day. The School attracts and retains deserving and talented children whose families qualify for such assistance. The admission decision is based solely on each student’s academic and personal qualities—independent of the family’s ability to meet the cost of an FWCD education. Thus, admission to FWCD and the awarding of financial aid are two separate decisions. Financial aid is awarded annually and granted on the basis of demonstrated financial need (determined by submitting a Parents’ Financial Statement, current IRS tax return and W2 forms), satisfactory performance and the School’s availability of funds. For the 2017-18 academic year, more than $2.8 million was awarded in financial aid. This translates to one in every five students. Fort Worth Country Day currently offers 22 Advanced Placement (AP) courses. In 2018, 194 students took 544 exams. One hundred seniors submitted 717 applications and were admitted to 136 colleges and universities. They attend 53 different institutions throughout the U.S. and internationally. Sixteen students were recognized by the National Merit Scholarship Corporation and National Hispanic Recognition Program. The class was awarded more than $13.7 million in merit-based scholarships and awards. Sixty-one percent of the members of the Class of 2018 attend colleges and universities throughout the U.S. and internationally. Thirty-nine percent of the class attend Texas colleges and universities. FWCD’s athletic tradition is renowned. Dynamic Physical Education, which includes lessons focused on fitness development, coordination, body management and game-playing, starts immediately in kindergarten. In Middle School, students pursue a sampling of athletic endeavors in a physical education developmental program that introduces them to the sports offered in the FWCD athletic program, and competitive, interscholastic sports begin in seventh grade. Upper School students may choose from 23 varsity sports. Athletics not only promotes healthy bodies, it teaches perseverance, sacrifice, discipline, sportsmanship and teamwork—valuable tools to take into adulthood. FWCD varsity sports include baseball, basketball, cheerleading, cross country, field hockey, football, golf, lacrosse, soccer, softball, swimming, tennis, track and field, volleyball and wrestling, divided into three sports seasons: fall, winter and spring. Fourth-grade, Middle School and Upper School students may also participate in ballet to fulfill their athletics requirement. Varsity teams compete in the Southwest Preparatory Conference, which comprises 16 schools, 15 from Texas and one from Oklahoma. FWCD offers the finest of the fine arts. Visual arts classes are offered at every grade level. Students experience hands-on learning through drawing, painting, sculpture, ceramics, photography, print and digital media, and more. Children begin their musical journeys in kindergarten with First Steps. Band and string orchestra are available to Middle and Upper School students. FWCD is the only independent school in Fort Worth to offer a comprehensive band and K-4 Lower School Strings program. The School has a Middle School and an Upper School band/drumline that perform at football games, festivals and concerts. Middle School and Upper School choral programs present challenging vocal literature for concerts and competitions and provide ensemble and solo opportunities. Theatre classes begin in fifth grade, and older students explore performing, technical theatre and playwriting. Plays and musicals are presented in Fort Worth Country Day’s own Scott Theater. The School’s celebrated ballet program begins in fourth-grade. Students in grades 4-12 may take ballet as an athletic credit. 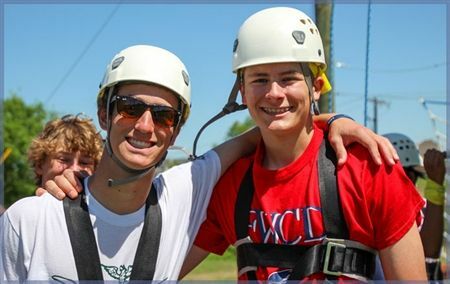 Fort Worth Country Day offers a variety of enrichment programs throughout the academic year, as well as a diverse range of classes during the summer months through Falcon Fun in the Sun camps. School-year enrichment programs are geared toward Lower School students to provide specialized instruction and further exploration into and beyond the curriculum. Summer camps include performing arts, sciences, languages, sports, visual arts, and STEM and STEAM sessions, as well as academic classes for credit for older students and academic refresher courses for younger students. Students enjoy university-quality library services at FWCD from a team of three professional librarians and one library assistant. There are two libraries on campus with a combined collection of nearly 33,000 volumes. Downloadable fiction ebooks and audiobooks are available for checkout on most devices. Online research databases, which contain books, encyclopedias and periodicals, are available for all ages and can be accessed anywhere. 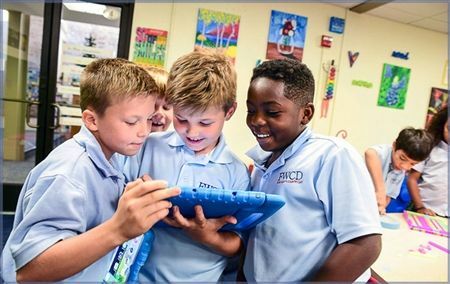 The Lower School and Moncrief libraries support multiple literacies, including digital, visual, textual and technological, in order to prepare students in the 21st century. FWCD’s technology is fully integrated into the curriculum at FWCD. Students utilize modern tools to enhance the academic program. A dedicated group of technology professionals provide support and services to the entire Fort Worth Country Day community. In Lower School, iPads and interactive whiteboard technology have been placed in every teacher’s classroom. There is also a full iPad lab, and the library features laptops for student use. Lower School teachers use technology to enhance the educational experiences of students, integrating technical tools into their lessons in appropriate and meaningful ways. In Middle School, all students purchase an iPad as a school supply and bring it to school every day. The iPad Coordinator supports teachers and students, guiding and facilitating the use of the iPads, which allows students to grow and experiment using technology in the classroom. There is also a dedicated computer lab in the Middle School, and all teachers have interactive whiteboard technology in their classrooms. In Upper School, students bring their own laptop to school each day. Laptop computers are used as an extension of the academic program. Research, writing, design, collaboration and communication are hallmarks of the Fort Worth Country Day technology programs. FWCD supports a fully wireless campus with broad, public Wi-Fi access across all buildings and fields. Internet connectivity is supplied through a 1GB circuit and supports more than 700 desktop and laptop computers. Teachers have access to many educational software titles, as well as Microsoft Office, Adobe Creative Suite and many more. A Faculty Initiative in Technology program allows teachers to continually develop new teaching strategies involving technology integration. A distance-learning lab allows students and teachers to engage in selected courses offered by the Malone Schools Online Network and to collaborate with worldwide peers. The School’s website, fwcd.org, serves as a public viewbook. There is also a private login section of the website that serves as a portal for all FWCD communication. Parents, students, alumni and faculty/staff can access teacher and athletic web pages, report cards, assignments, schedules, and directory and calendar information—all online. Electronic newsletters, as well as social media feeds, provide additional ways to keep up-to-date on all campus activities. An auto-dialer, Connect 5, notifies all families of emergencies on campus. FWCD parents are offered a number of ways to become involved in the life of the School. Organizations such as the Parent Faculty Association (PFA), Falcon Club and Supporting CAST (Creative Arts Students and Teachers) allow parents and grandparents the opportunity to give their time and talents in efforts to help fulfill the purpose of the School. At more than 3,500 members strong, the FWCD Alumni Association is a vital part of the School. Members often give back to their alma mater by serving in leadership roles, giving to The FWCD Fund (the School’s annual fund), and volunteering on campus and beyond. FWCD alumni remain engaged through gatherings such as Alumni Weekend, Falcons on the Road and various alumni sporting events, and they stay connected through Alumni Relations communications, social media, The Falconer magazine and campus visits. - Shady Oaks Country Club (320 Roaring Springs Road) - students will meet by the flagpole in the lower parking lot. The FWCD Fund, the School's annual fund, provides the School with the flexibility to respond to immediate opportunities to keep FWCD growing and thriving. The tradition of giving at FWCD has always been important and demonstrates the loyalty, commitment and spirit of the Fort Worth Country Day community. Parents, grandparents, alumni, faculty/staff and friends are asked to contribute to this fund, which exceeds $1.3 million in income to FWCD each year. 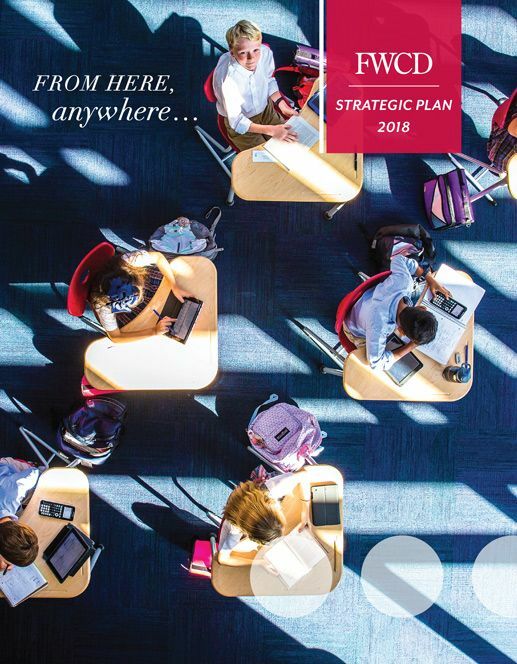 This support allows the School to effectively manage the rate of annual tuition increases; design new opportunities and initiatives; and retain and attract remarkable students, distinguished faculty and hard-working staff. A nationally affiliated program, Breakthrough at FWCD extends the Falcon spirit of service to high-potential underserved students throughout the city of Fort Worth. The program provides them a tuition-free series of summer and Saturday classes/workshops that foster the students’ progression to college—a six-year process that empowers them to build academic confidence, leadership skills and knowledge for the admission process. Also, the program’s unique students-teaching-students format promotes mentoring and inspires high school and college youth toward careers in education. Breakthrough is hosted on campus in the “off” hours, and many FWCD Upper School students volunteer in the program each year. FWCD is the North Texas site for the Duke University Talent Identification (TIP) Academic Adventures and Scholar Weekend programs. Students are accepted into the Duke TIP program by scoring in the 95th percentile or higher on a grade-level standardized achievement test, aptitude test, mental ability test, approved state criterion referenced test or at 125 or above on an IQ test. In the case of both Duke TIP programs, engaging courses are taught by FWCD faculty in classrooms across campus. This year mark’s FWCD’s seventh year as a host site for Duke TIP programming. Academic Adventures courses, hosted once in the fall and once in the spring, are challenging one-day explorations of engaging concepts and curriculum for students in grade 4-6. The Duke TIP Jim Aldridge Scholar Weekend, named for a beloved faculty member who was an integral part of Duke TIP programming at FWCD, brings students in grades 8-11 to campus over a Saturday and Sunday in the spring for intensive academic enrichment programming. Both programs sharpen skills, offer students an opportunity to meet similarly motivated peers and help students get excited about learning. Courses emphasize experiential learning and introduce topics that may not be available in students’ local schools. Fort Worth Country Day is a founding member of the Malone Schools Online Network (MSON), which provides Upper School students with distance-learning instruction through virtual online classes that enhance FWCD’s curriculum. These courses promote the values of the Malone Family Foundation and are taught by teachers from Malone Schools in the network. The teaching professionals are experts in their fields; many have experience with independent education and share a commitment to excellence, small class sizes and personal relationships. FWCD students in grades 11 and 12 may apply to take MSON courses, which serve as a high school enrichment elective course and meet twice a week during the regular school day. Each course takes a blended approach, combining synchronous instruction, real-time video conferencing seminars, with asynchronous instruction, recorded lectures and exercises that students complete outside of class. The result lies somewhere between a “flipped classroom” and a “virtual Harkness table.” Each course has a minimum of six students and a maximum of 16, allowing for a virtual discussion seminar that is delivered in high-definition classroom set ups. In the 2017-18 academic year, 20 FWCD students are enrolled in 13 of the 29 courses offered. There are 22 schools currently participating in the MSON program. At Fort Worth Country Day, we believe that understanding and respecting differences not only inspires compassion and empathy, but also fosters intellectual curiosity and creativity. We embrace the diverse cultures, experiences and perspectives that comprise and enhance our learning environment. We commit to sustaining and growing an intentionally inclusive community.